We carefully curated the selection of items we are offering for sale in our retail area. Our core values decidedly influenced the decisions we made. We’re wild about our MiiR camp cups and insulated water bottles, and hope you will be too! After researching countless options for customized bottles, Lee found the MiiR bottles on a visit to the Patagonia store. As a B-Corp and industry leader we look up to Patagonia. So naturally, knowing they loved MiiR we dug into the company to learn more. We loved what we found. MiiR is a product based company first. They design for daily use, specializing in modest products built on function and simplicity. MiiR gives 3% of revenue to organizations with sustainable methods of empowerment. Every MiiR product funds a trackable giving project, so you can enter your code and see which projects your product helped to fund. Like everything at our personal training studio, the goods we’ve chosen to sell pass our personal test. We love our MiiR bottles, but the camp cups have really won us over! At Hyatt Training you’ll find more than just a good sweat. Our core values guide each decision we make every day. While we’re passionate about what happens inside our studio walls, we care just as much about what happens in our community and beyond. We’re committed to reducing, reusing and recycling everything we can, which is why we’re so jazzed about offering re-usable mugs and bottles. Providing financial support is another way that we connect to our community and we love supporting a B-Corp like MiiR who donates 3% of their revenue to innovative and educational projects. 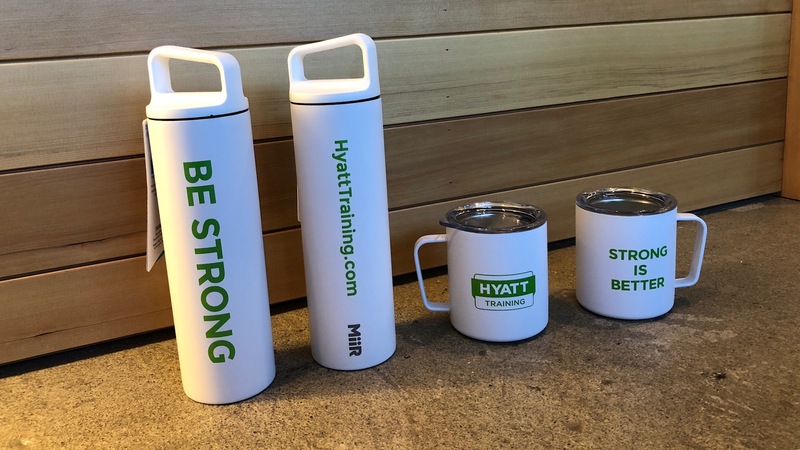 To learn more about our personal trainers, or to set up a free consultation to see how they could help you, email us at Go@HyattTraining.com.